For my husband’s birthday I decided to make a surprise cake in honor of his 23rd year (yes, we married young). Since baking is not my strong suit, I went with a recipe that calls for boxed cake mix with a few added ingredients and a recipe for homemade icing–that at least I thought I could make from scratch. 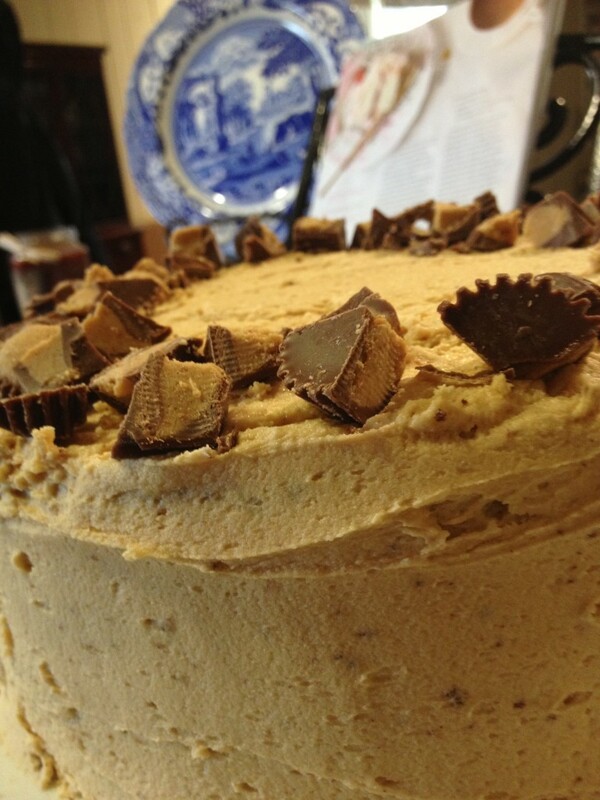 The cake of choice: Peanut Butter Chocolate Cup Cake. It’s kinda of like a Reese’s Cup turned inside out. Sounds a little adventurous, but the directions seemed relatively easy to follow and I was using boxed mix after all. Plus, the recipe said it only took about an hour and a half to make. No biggie. Hah. About a half of box of powdered sugar on the counter later, I realized there was no way this cake was going to be finished on time. I was still only halfway through making the icing and the cake layers were still cooling. Let me say this. I don’t know what makes the center of the cake stick to the cake pan. I tried everything to get the cake out of the pan without messing it up, but my layers ended up being a little patchy on top. ( If you have any advice about this please, please tell me!) About the time the recipe said I should be wrapping up, I was just at the point of icing the cake. Icing is a whole lot harder to do when entire chunks of cake are missing. 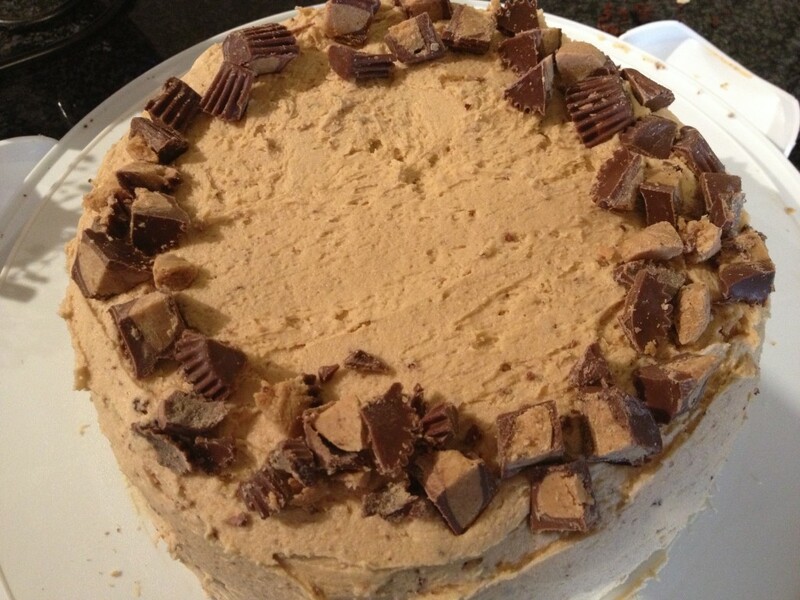 So, I layered the homemade peanut butter icing on thick. Thick enough to where you wouldn’t be able to tell my baking skills were lacking. I’ll admit there were moments went I just wanted to put my fist in the middle of it. After 2 hours and a few close calls, the cake was completely iced! All that was left to do was to top it with chopped Reese’s cups. I’ll let you in on a little secret. Refrigerate the Reese’s cups before chopping them. It’ll keep them from becoming a melty mess. After, sprinkling some on top, the cake was complete! But I still wasn’t in the clear yet! I had to drop the cake off at a friend’s house (we were surprising my husband there later), get back home, get ready, and go pick up the birthday boy from work. Thanks to the cake taking forever, I only had an hour and a half to do it all! Fortunately, I got it all done. Hubs was totally surprised by the cake. He and our friends loved it. Everyone says the first time you make a recipe is the hardest and after that it’s easier and goes a lot faster. I don’t know if I believe them or if I’ll ever work up the nerve to make this cake again. Please excuse the tiny bits of cake mixed in with the icing. Cooking is full of adventures. Even when you stick to the recipe, things don’t go like they’re supposed to. However, when you’re cooking for the ones you love laboring away in the kitchen is a little sweeter.